Welcome to our nightmares and fantastical dreams. Each year for a few we've done something over the top in our garage on Halloween while tying in a snapshot of the story of God Himself from some pretty unique angles. Preachy? Not so much. Bizarre? Sure, why not? I learned from the best long ago, generosity gets attention. (No matter where you lived in my neighborhood growing up, on the last day of October you visited the guy handing out Happy Apples.) We also know people love a show. So we try to go big with both. Here you'll see what a classic rock couple with a taste for the creepy and strange can do with a regular garage, a little imagination and a lot of time. Visitors were greeted at the door by a very chipper lady with a very British accent. "Oh, we have guests! Welcome to The Lion's Head! You look like you've all traveled a great distance to get here. So, I s'pose you'll be wantin' to see him then." She pauses for recognition, then continues, "You know, the doctor. Dr. Griffin. Dr. Claude Griffin? The one that's been messin' 'round the the monocaine invisibility... The Invisible Man! Yeah? "Right, well he's so well known 'round these parts. This fellow had a great, great... something ancestor who stayed here many years ago. Caused a bit of ruckus. We didn't like that at the time. But this fellow, he's alright. He's actually working to reverse the invisibility formula, isn't he? And he does draw a bit of a crowd. "But, I do want to warn you... When they were first working with this monocaine powder they tested it on a dog. It turned the dog stark white, but also stark raving mad. So, you might say our doctor is a little loose in the attic. He's fairly harmless though, so, would you like to see him? I mean, you can't actually SEE him, can you? But maybe we can see what he's working on. Come on in!" She leads you through the pub and into the current quarters of Dr. Griffin. While he's nowhere to be seen, his typewriter is working furiously. "Oh look at that!" she exclaims. "He's typing up some notes, isn't he?" This being a mid-week Hallow's Eve we wanted to stick with the classics, and "The Invisible Man" was one of the few Universal horror flicks we had yet to recreate. While our scene was set at The Lion's Head pub and inn where Dr. Jack Griffin briefly stays hoping to reverse his invisibility formula undisturbed, we chose our doctor to be a descendant of the original, much in keeping with the film sequels. We did, however, give our doctor the name Claude Griffin, a direct reference to Claude Rains, the actor who portrayed the first Invisible Man. In addition, our pub keeper was called Gloria after Gloria Stuart who played Flora Cranley, the love interest of Dr. Griffin in the movie. We were a bit nervous with rain in the forecast, but a handy tent borrowed from our church and some good timing on the heavier downpours worked out great. We still managed to hand out about 80 treat bags, along with a number of glow sticks for our early visitors which we were gifted by local police after a recent neighborhood National Night Out event. Thanks, police! The rain put a damper on our haunted wagon friends, but they showed up anyway, this time in a small caravan of regular vehicles. This year we learned that we are affectionately identified by this group as "The Duck House," a title we happily embrace. Freaky Fact: Speaking of ducks, this year's themed duck was a bit accidental. Purchasing began before film research, and a very plain white duck seemed best to mimic invisibility. It wasn't until we watched "The Invisible Man" again and heard the mention of a bleached dog in early monocaine experiments that we realized we could actually work the duck into the presentation, which quite nicely tied the whole thing together from start to finish. Our treat bags also contained some pretzels, Wonka candies, and a fun treat NOT to eat—a bottle of magic disappearing ink. 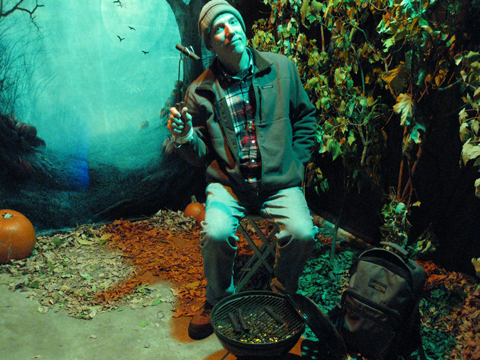 As you walk through the deep forest, you come across a couple's campsite out in the woods. They seem a bit upset, asking what you are doing out here and if you happened to see anything odd. Apparently they were attacked by... something. A bear maybe? 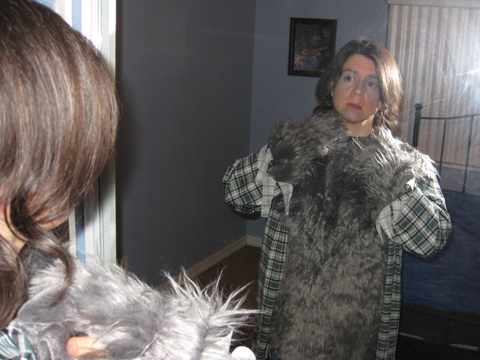 But it was too fluffy to be a bear. They're not sure, but it scratched or bit the female, who is wrapped up in a thick blanket and not looking well at all. The man managed to chase whatever it was off with a flare or something, but was also injured on a tree branch in all the excitement. With some concern, they warn you to be careful out there. After sharing their harrowing story, the woman explains she's not feeling well and excuses herself to go rest in their tent. The man offers you a hot dog, but finds they've been left on the fire too long and are now charred beyond recognition. He apologizes, and continues chatting with you. 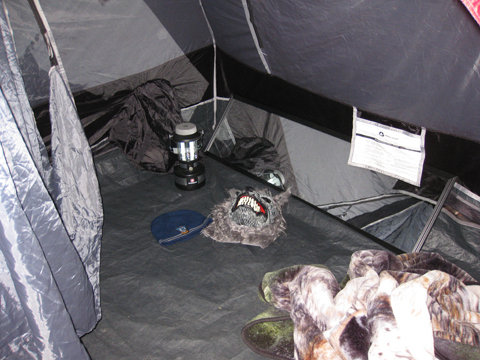 A few moments later, odd sounds of someone in pain begin to come from the tent. The man asks if everything's alright in there. A snarling, "Go away!" comes in response. 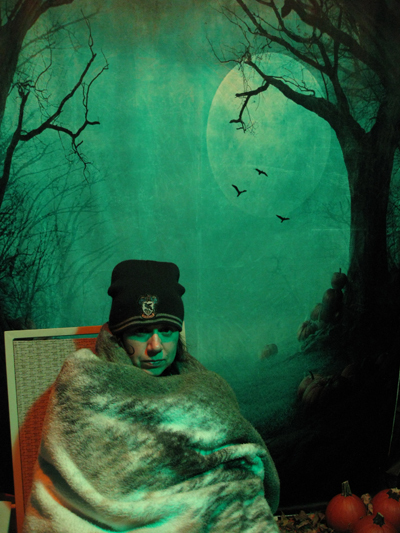 He sticks his head inside to see what's happening as the tent begins to shake. 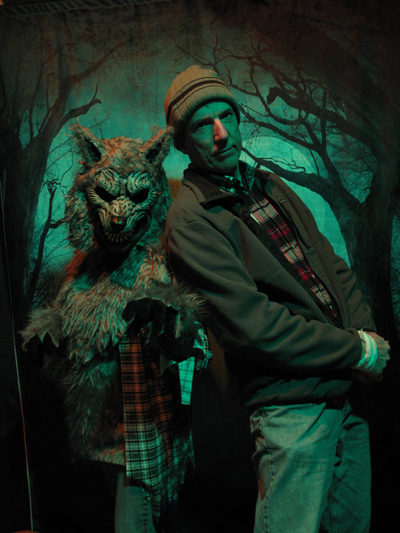 Suddenly from around the side of the tent a vicious, howling wolf appears! Yet walking upright like a man? 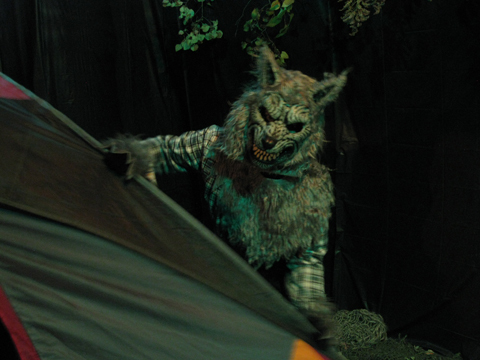 Ferocious and furry, the female camper has transformed by the light of the full moon! Your group leaps back in terror as the man comes around and attempts to calm his friend. Looking around with a menacing mouth full of sharp teeth, she unexpectedly and gruffly speaks. "Well, I feel better now!" 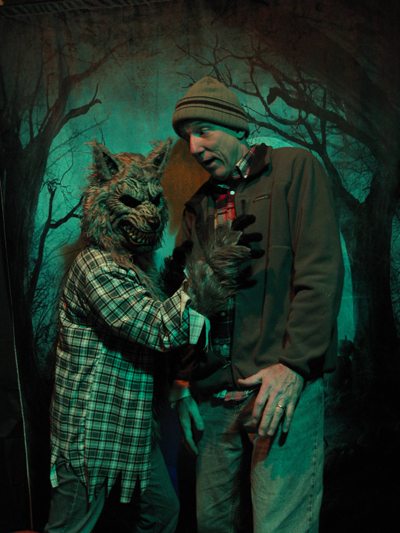 Turns out this wolf is not so mean, and he talks her into handing you a packet of Halloween treats. She'll even let you pet her furry paw... IF you're brave enough to approach. 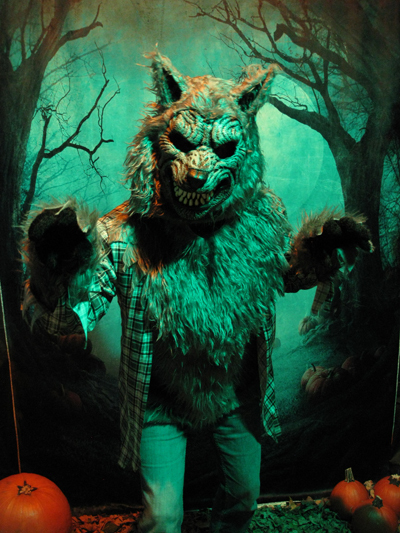 As you make your way down the moonlit path through the woods, the wolf's howls can still be heard, along with a growling, "Happy Halloween!" It's always double trouble with these two. 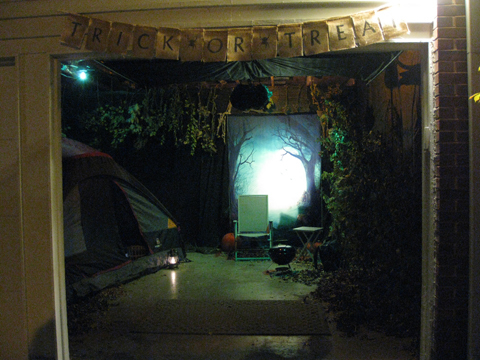 Your view upon entering the garage... er, forest? They really are happy to see you, but why are you out in the woods? By the light of the full moon, she really doesn't look so well. Did you notice? Her blanket is a wolf. Would you like a hot dog? Sorry, they kinda got burnt. Now there's something you don't see popping out from behind a tent every day. Thankfully. 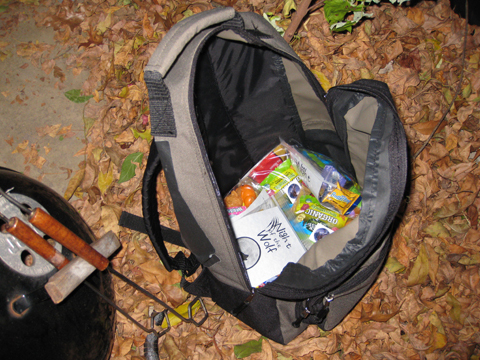 These campers have a backpack full of treats to share. 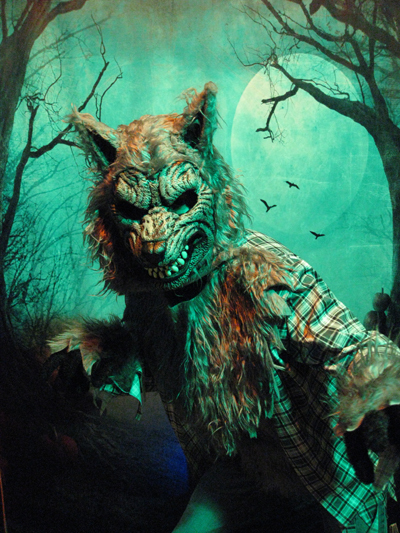 Are you brave enough to take a treat from a wolf? Maybe she's not such a mean wolf after all. It just so happens Lon Cheney Jr. as Larry Talbot in the 1941 film "The Wolf Man" (quoted in the teaser above) is my favorite classic Universal horror character. 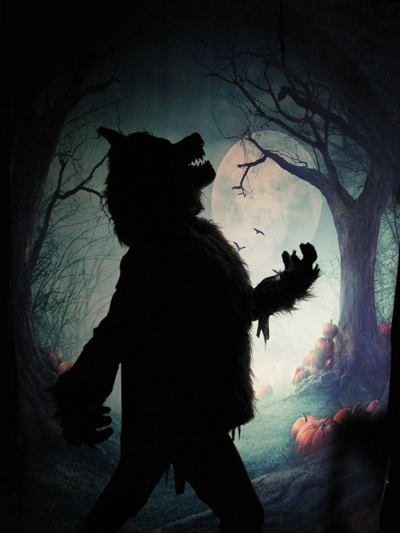 Along with other admired wolf types, such as Quentin Collins of Dark Shadows and Harry Potter's Remus Lupin, taking on the were-role was simply bound to happen sometime. We actually purchased the phenomenal jaw-motion mask and costume shirt at the end of last season, and had a pretty good idea of this year's direction at that point. Even a wolf's gotta dress for success. Some of the kiddies were wondering just what was happening inside that tent. Here's a hint. 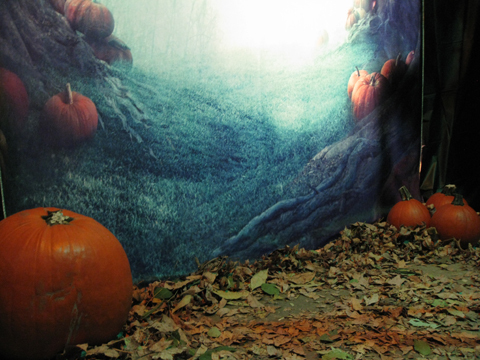 A more recent acquisition was our fine photography backdrop, which included a moonlit path lined with pumpkins. 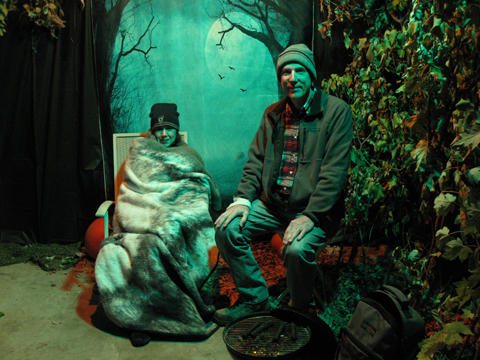 Real pumpkins were set up around the edges to move from a 1D to 4D effect, and special backlighting brought out the full moon's glow. 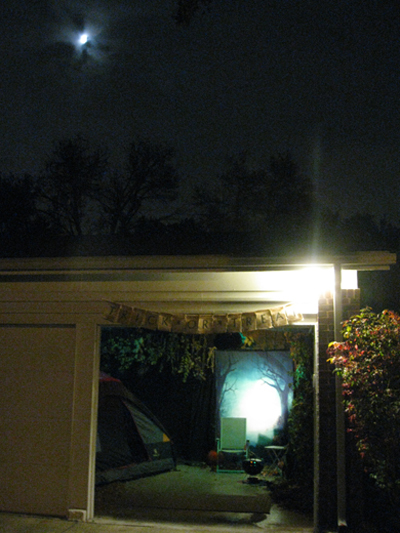 It was also very cool to see the very real waxing moon appear through clouds above our garage for a portion of the night. The very real moon above. It wasn't full, but the clouds diffused it perfectly. 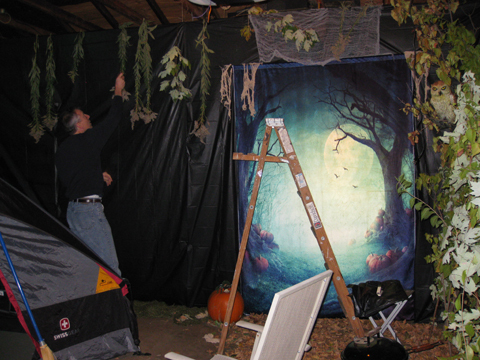 Large, cut branches and yard leaves scattered around our personal tent enhanced the outdoorsy feel to this set, which was actually quite simple overall. Amazing what you can do with what you have lying around. 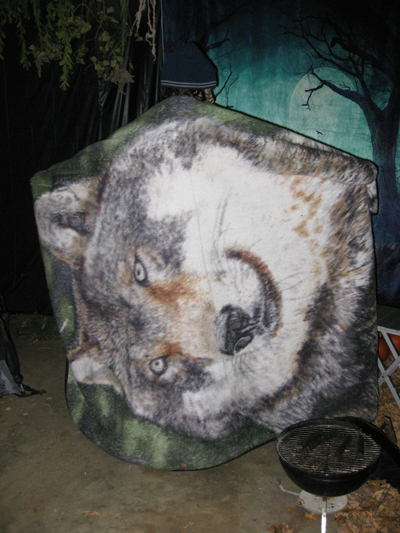 Another thanks to mom for not only corralling the kiddies, but also loaning us that thick blanket which, as one might expect, featured the image of a wolf's head. Freaky Fact: The warning from inside the tent was yet another homage, this one referencing the beginning of Michael Jackson's transformation in the long version of the "Thriller" video. While I claim this as the best music video of all time (of course featuring STL's own horror master, Vincent Price), younger viewers may find it a bit... intense. The brave can view the whole thing here. Find the referenced scene at 2:23. 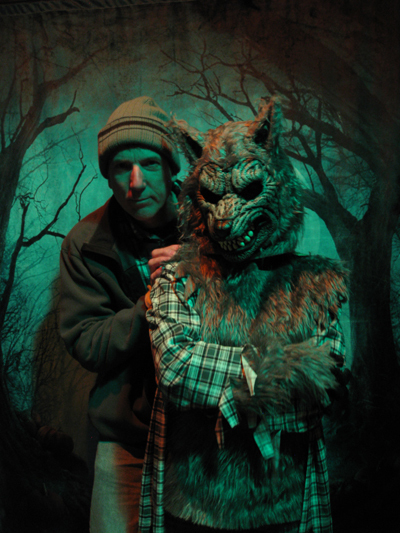 For a cool but dry Tuesday night, we had plenty of visitors, including at least one family who just HAD to come back and see us again, plus our mysterious late night friends who annually appear via their haunted wagon. About 80 treat bags were handed out, so not too shabby. Recipients scored a classic Halloween character rubber duck, with a one-in-four chance of getting either a Dracula, Frankenstein's monster, witch or, of course, wolf duck. We also happened upon some organic "Black Forest" gummies, which both fit the outdoorsy theme and included werewolf shaped pieces. 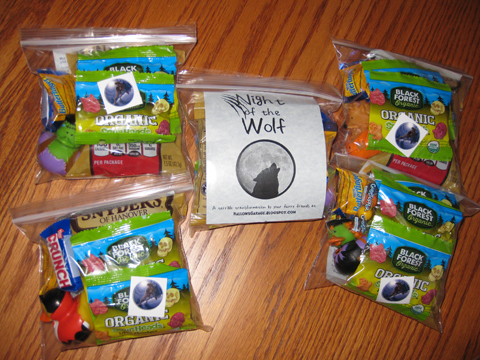 A werewolf sticker was included as well, along with our usual pretzels and Wonka candies. This year's theme card was naturally all about transformation, highlighting stories and verses such as Daniel 4:28-37, 2 Corinthians 5:21 and Romans 12:2. This was also the first year we added "The Big Story" to the site. Got a picture of us? Want to know more about The Big Story? We can send you a Bible or another helpful book about Jesus absolutely free. Just fill out this form, or stop by if you're in the neighborhood. HEY! If you see "Older Posts" (just above), click for more Hallow's fun // ©2011-17 //. Awesome Inc. theme. Powered by Blogger.